HM Revenue and Customs (HMRC) yesterday published estimates of the revenue raised by different HMRC taxes in England, Scotland, Wales and Northern Ireland. These taxes cover 80% of total revenue, since they do not include revenue not collected by HMRC, such as council tax, business rates and vehicle excise duty. The results for 2012–13 are summarised in the figure below. This is the first time that most sources of revenue have been broken down to show the amount raised in Wales and Northern Ireland separately and what is particularly striking about these estimates is how much lower taxes per person in these areas are than in England or Scotland. Note: ‘Capital taxes’ are capital gains tax, inheritance tax and stamp duties on shares and property. The HMRC estimates run from 1999–00 to 2012–13, although for all the main taxes the 2012–13 (and often 2011–12) ‘estimates’ simply assume that the share of revenue is the same as in previous years. Source: Authors’ calculations using HMRC statistics and 2012 population totals from the Office for National Statistics. 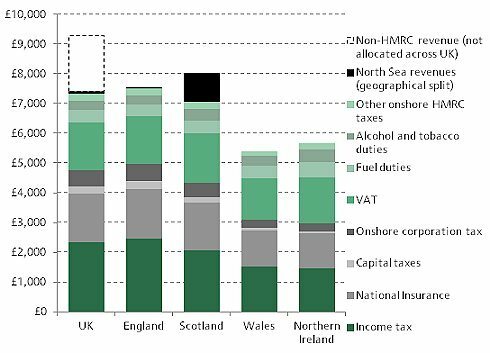 HMRC tax revenue per person in 2012-13, excluding revenue from North Sea oil and gas, is 26% lower in Wales (at £5,400) and 23% lower in Northern Ireland (£5,700) than in UK as a whole (£7,300). This largely arises because Wales and Northern Ireland have less income and wealth than the rest of the UK and correspondingly raise less revenue per person from all the main taxes on earnings, savings and profits: income tax, National Insurance contributions (NICs), corporation tax, capital gains tax, inheritance tax and stamp duties all yield at least 25% less revenue per person in both Wales and Northern Ireland than in the UK as a whole. Wales also brings in significantly less VAT revenue per person than the UK average. But in Northern Ireland VAT revenues are only slightly lower than in the UK as a whole – because Northern Irish households (or non-household actors that cannot reclaim VAT on their purchases such as VAT-exempt traders and some public sector bodies) spend more of their income on goods and services subject to VAT. And Northern Ireland actually provides 18% (£76 per year) more revenue from fuel duties per person than UK as a whole and a remarkable 79% (£120 per year) more tobacco duty. North Sea oil and gas aside, tax revenue in Scotland (£7,100 per person in 2012–13) looks much more like that in the UK as a whole (£7,300). Scots do pay £290 per year less in income tax on average, partly because incomes in Scotland are more equally distributed, with fewer of the very high-income individuals who provide such a large share of income tax revenue in the UK as a whole. But Scots contribute slightly more in VAT and in alcohol and tobacco taxes. Unlike for Wales and Northern Ireland, these patterns were largely known already, since the Scottish government already produces estimates of Scottish revenues (the latest being for 2011–12) in Government Expenditure and Revenue Scotland (GERS) . In most respects HMRC have used a similar methodology and produced similar estimates to those in GERS. In three areas, however, HMRC attributes somewhat lower revenues to Scotland than GERS does: onshore corporation tax (15%, or £0.4 billion, lower), taxes on North Sea production (12%, or £1.3 billion, lower) and stamp duty on shares (40%, or £0.1 billion, lower). UK corporation tax applies to profits created from economic activities located in the UK. Where firms operate in more than one part of the UK, it is difficult to know how much of their profits are attributable to activities in each location, and companies are not required to divide up their profits in this way. Both GERS and HMRC approximate the division of onshore corporation tax revenue based on estimates of the location of profits. GERS uses a regional measure of profits contained in the ONS regional accounts that is predominantly based on the share of wages earned in Scotland. HMRC allocates individual companies’ profits to regions, largely based on the location of their employment, and aggregates this to get the share of profits in each location. These different methods yield somewhat – albeit not radically – different estimates. Onshore corporation tax revenue in Scotland in 2011–12 is estimated to be £3.0bn (9.0% of UK total) in GERS and £2.5bn (7.7% of UK total) by HMRC. This £400m difference is equivalent to about 1% of all Scottish revenue. Neither of these estimates is clearly superior to the other, and both may be some way off. Profits are not necessarily generated in proportion to the number of employees, or their wages. Some employees may be more instrumental in generating profits than others; and profits also arise from capital assets – both physical (such as buildings and equipment) and intangible (such as intellectual property and brand value) – the location and contribution of which may differ from the location and wages of employees. Calculating how much of a company’s profits are attributable to economic activity in different locations is conceptually and practically difficult and is the source of many problems in international corporate taxation. How North Sea oil and gas revenues would be divided in the event of Scottish independence is uncertain. Both HMRC and GERS show two illustrative possibilities. One divides North Sea revenues according to Scotland’s share of the UK population. Unsurprisingly, on this basis GERS and HMRC both report that Scotland’s share of North Sea revenues in 2011–12 was 8.4%. The other approach taken is to divide revenues on a geographical basis according to the location of individual oil and gas fields. On this basis GERS estimates Scotland’s share in 2011–12 at 94% (£10.6 billion), while HMRC’s estimate is 83% (£9.3 billion). This disparity is not because they divide fields between England and Scotland differently: both use a boundary that was established in the Scottish Adjacent Waters Boundaries Order 1999. Rather, it derives from differences in their models of how much taxable profit arises from different fields. GERS allocates revenue from stamp duty on share transactions to Scotland based on the proportion of share owning UK adults that are resident in Scotland. That is a poor guide to what Scotland’s share of stamp duty revenue would be under independence. The number of people owning shares does not tell us the value of shares traded each year (the tax base). More fundamentally, the location of the shares’ owners is not the relevant consideration for stamp duty, which is paid on transactions of shares in UK registered companies. HMRC's approach recognises this, allocating stamp duty revenue according to companies’ registered addresses (weighted by share turnover). HMRC’s lower allocation of stamp duty revenue to Scotland – 5.0% (£139 million) rather than the 8.3% (£231 million) recorded in GERS for 2011–12 – is therefore the better guide. The new HMRC statistics are a welcome additional source of information. In some cases the estimates are only rough approximations to tax receipts in different locations, and further devolution or Scottish independence might change the location of revenues. However, these figures reveal some interesting differences across different parts of the UK. This work has been funded by the Economic and Social Research Council through its ‘Future of Scotland’ programme.